Banjo, the creepy/awesome cyber-stalking app (I mean social discovery service) that shows you who’s nearby based on their Facebook and Foursquare check-ins, geotagged tweets, TwitPic and Instagram uploads, is now a web app, too. In case you haven’t yet download the iOS or Android application to your mobile device (or are some kind of Windows Phone-using rebel), you can check out the service via the recently updated Banjo website instead. To use the online version, you just type in any city or zip code to explore what people are saying and doing there in real-time. And if you’re using a modern browser that supports geolocation, you can also use the online service to see those who are near your current location. The website is designed replicate the native mobile experience as closely as possible – and sure enough, it looks like a big ol’ iPhone app right there on the screen. According to Banjo Co-founder Damien Patton, the app’s adoption has surpassed the team’s expectations. They were aiming to reach 400,000 downloads by year-end, but ended up achieving the 500,000 downloads milestone before the year was out, six months post-launch. (Note: that’s iOS/Android combined downloads). Patton adds that the company has also seen over 1 million friend alerts in its first month as well, referring to the newer feature that pings you if friends you’re connected to on social networks are nearby. Banjo is live in over 175 countries, which is why the company is now focusing on adding support for additional languages. It recently added Spanish, and has just added Turkish and Italian to the Android app, too, with the iPhone to follow in January. There has been an explosion of these “social discovery” apps this year, many of which leverage existing social networks in an effort to connect you with those around you. In Banjo’s case, its closest competitors are apps like Sonar, ntro and Mingle, which are more focused on introductions and networking than Banjo is. 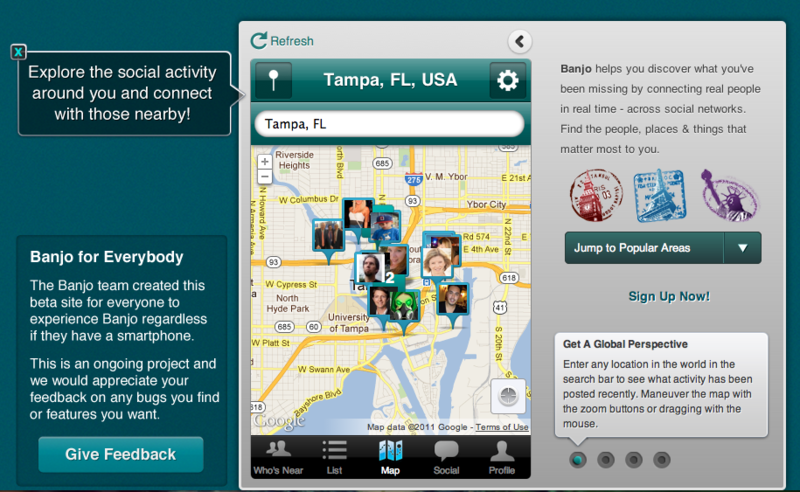 You can check out the newly web-ified version of Banjo here.